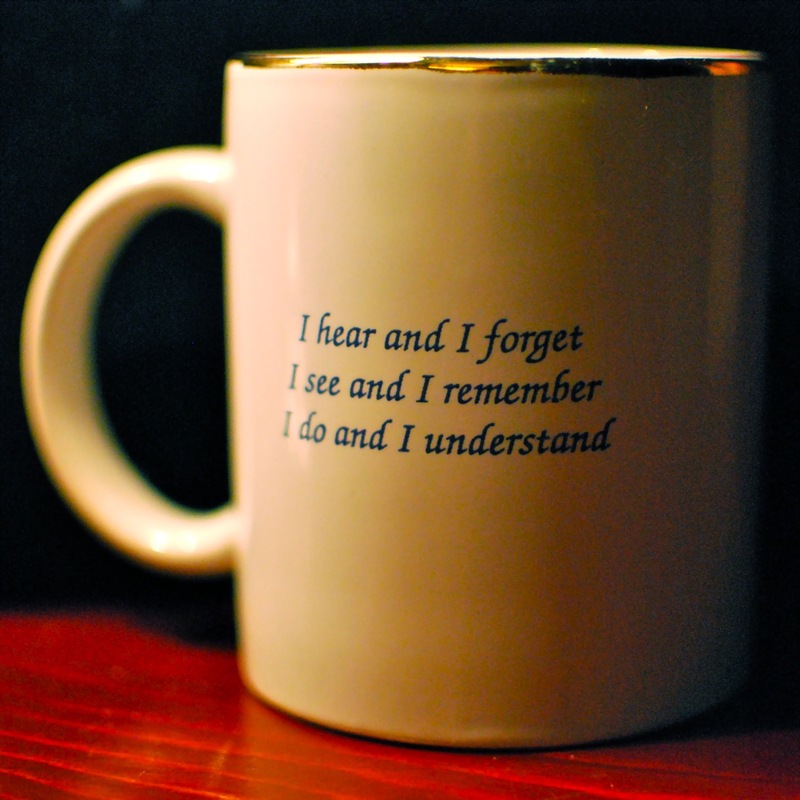 I would never have predicted that a mug from a university summer job would become an important coaching tool for software developers, managers and executives more than fifteen years later! Two programmers dubbed what is now my pen holder the Mug of Truth after I referred to the wise words from Confucius written on it while coaching the programmers on how to help game designers understand some new technologies. As much as I value the philosophy of I do and I understand, I have to admit I sometimes have my days where I wish I could just tell people what I needed them to understand. Inevitably, they walk away, often forget what was said and rarely put any of it into practice. The video game industry has a lot of experiential learners. In other words, a concept will only be understood once it is actually tried. That sometimes means learning things the hard way. Video games are also visual and interactive products with many artists, animators and designers involved in the production. The two programmers did remember what I showed them on the mug and left space in their demonstration for the game designers to participate and try the technology themselves. Unfortunately, the group was reluctant to do that. Huh. Well, we learned something. We are conditioned to expect training to be delivered in a lecture format. Both the programmers in this story have recently left the company. I gave one my other Mug of Truth to remind him of what he learned. When I started transitioning the team to Agile and Scrum three years ago, he was more than skeptical. He eventually accepted it and gave it a try. He then adopted the techniques and kept using them, even when I no longer insisted. After a few more successes under his belt, he became a believer. He was no longer just following a process. He was truly customer-focused, working and thinking about his work in terms of iterations and business priorities. He understood. My past manager also recently left the company. He is an avid learner, constantly reading management, leadership and business books and trying out new concepts he had learned. While we worked together, we evolved a mutual coaching relationship. He would share with me how things worked at our company and I would give him feedback on what worked and didn’t work, based on my own experience. However, his understanding really accelerated when he became the head of a studio that was 6000 km away. With the distances and the cultural differences, he had to try (and iterate on) a lot of management techniques that he had never really had to put into practice. What both men might not know, though, is that I learned a lot from them. Both of them challenged me. In the years I worked with them, I had to put into action everything I thought I knew about coaching, giving and receiving tough feedback, how programmers and executives think and work. As a result, they helped me understand a lot more than I did three years ago. Both of them had been with the company a long time, so it was time that they move on. I will miss them, but I look forward to hearing about their new adventures and what they learn from them. As a newly appointed disciple of Liza, I was trusted with the Other Mug of Truth, with which I shall shine the eternal light of wisdom upon distant lands. You’re giving me more credit than you should. Our team manager deserves more praise than I. She actually made my biggest concern go away: how could a team have a full-time manager while the technical leads are still taking the decisions? Well it works, and now I don’t see any other way. How did we do it? I think our agile process really kicked off once we went beyond “papers on a board”. On a personal basis, the focus on “making increments” as early as when we were discussing requirements with the client was certainly a turning point. On a team basis, the periodic backlog prioritization from client votes really helped everyone understand both the value and the limits of our development capacity. While there was additional magic by our manager behind the scenes, those two elements really stood out for me. I take care of your Mug of Truth as if it was still yours! It currently holds my numerous WWDC and GDC passes, and sits between two Totoro toys.